Corned beef was not something we ate very often when I was growing up. Mother made it for our St. Patrick's Day dinner along with the typical boiled vegetables, (post #6). She also occasionally made a wonderful meal-stretcher...corned beef hash. I loved that simple dish served on cold, winter nights so long ago. Although, in the past, I have also been known to enjoy a thick corned beef sandwich. These days, however, I think twice about ordering one because of the high fat content inherent in the meat. Corned Beef and Cabbage Soup, on the other hand, makes use of a small amount of corned beef, a large amount of vegetables and a delicious broth...a much more user-friendly way to go. 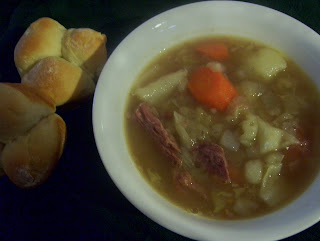 This old-fashioned style soup satisfies my occasional craving for corned beef and also allows me to keep the ingestion of fat to a minimum. None of the ingredients were measured...this is true peasant cooking...just add what you like added in the amount that makes you happy. Add corned beef to a large pot and cover with water. Bring to a boil, skim off foam. Cook for 5-10 minutes to bring out the meat flavor. Chop up the meat into smaller pieces. Add all of the vegetables and add more water to cover. Simmer partially covered until carrots and potatoes are tender. Mash some of the potatoes with the back of a spoon and stir well. Add 1 tsp bouillon and mix well. Taste and add salt if desired. Continue simmering until soup is the desired consistency. Serve. The flavor of this soup is better when it cools off slightly.